i got the idea for this blog post from her blog post today. eight years ago today... i was a nurse in the air force, assigned to eglin air force base, in florida. but at the time of september 11th, 2001, i was at a school (temporary duty) in texas. it was a normal class day, mostly boring lecture, when all of a sudden, the instructor was pulled out of our class. when he returned, he informed us that a plane had just hit one of the towers of the world trade center. being in the military, we were used to these kind of exercises. well not exactly this kind, but we were used to military exercises. but then the instructor went on to tell us that we were to all go back to our hotel rooms. we were to stay in our rooms, near a phone and wait for further instructions. ummm. okay. that does not happen during an exercise. what's going on here? and then we realized that this was not a drill; this was really happening. the united states was under attack. we asked a lot of questions, which the instructor really had no answers to. and then we were released from class, until further notice. a bunch of classmates and i all gathered in one room, glued to the television. in disbelief of what was happening and scared of what was yet to come. on this day eight years ago, almost 3,000 people were killed. let us never forget them and the heroic efforts of our country. 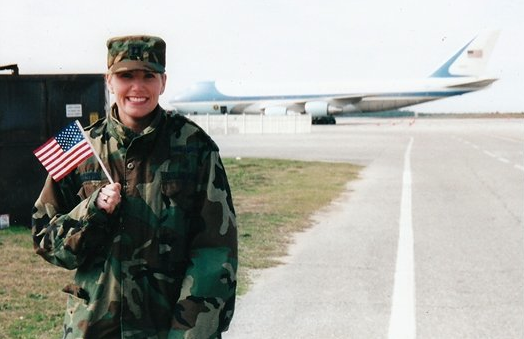 this is me, sometime around 2001-02, stationed at eglin air force base.